NOTE: This is a somewhat lengthy review, that gives a full overview of the plot and that includes many spoilers. The Last Hurrah for Chivalry was released in 1979 by Golden Harvest and directed by John Woo, who went on to originate the Gun Fu sub-genre with films like A Better Tomorrow. It stars Damien Lau (Green), Lau Kong (Kao) and Wai Pak (Chang). 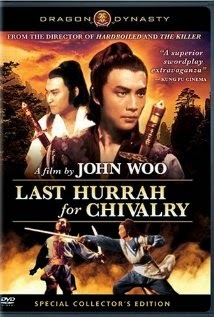 This is one of John Woo's early movies and feels quite like other films in the swordplay genre. Its chief antagonist is Kao Pang, a wealthy man seeking revenge for his family. Kao Pang is not skilled enough to kill his enemy so he finds a local hero named Chang and befriends him, in order to obtain personal justice. The heart of the film is about the friendship between Chang and another deadly hero nicknamed Green. The film opens at the wedding of Kao Pang, who is the wealthy son of a great hero and respected member of the martial world. Through conversations among the guests it becomes clear that Kao is a scholar, not a fighter, but he isn't virtuous and his knowledge is mainly in "the art of love". His bride is a prostitute from the Red Chamber who he paid 1,000 taels to marry him. Kao's villa is attacked during the ceremony by his father's enemy, Pai, who claims ownership of the land. As a fight breaks out, Kao is stabbed by his bride, who reveals that Pai paid 2,000 taels for her to kill him. Nearly all at the villa are killed, and Kao barely manages to escape with a few of his men. Kao is nursed back to health by his master who urges him to let the grudge go, but Kao wants revenge for his family and he begs his master to help. The master seems to sense darkness in Kao and says he must change his thoughts, to not think of evil anymore. The master tells Kao that he is not skilled enough to defeat Pai. Kao will need another to perform the task for him. Throughout the film, Kao pressures the master to help and to relinquish a special sabre in his possession, called the Moonlight Sword. In the versions I was watching, the subtitles suggest the blade is magical, but it is possible this was just poor translation. Each time the master resists and urges Kao to forget his evil thoughts. When Kao asks his master if a great hero can help him, his master replies that great heroes only serve great causes, not wealth. To secure a great hero, Kao decides he will have to create a great cause. The plot gets slightly convoluted at this point, though on second and third viewing there is a certain elegance to how the various plot threads fit together. Kao learns about a swordsman named Chang who lives with his sick mother and is trying to give up killing. Another swordsman, named Pray (also called Let it Be), is hounding Chang for a fight because he believes he can only be regarded as the greatest by killing Chang. Kao befriends Chang, helps him with his sick mother, and hires Pray to attack his master and take his masters sword on the day of Chang's mother's funeral. Pray nearly kills Kao's master, but fails to get the sword. He does inscribe a message at the scene, addressed to Chang, demanding a fight. 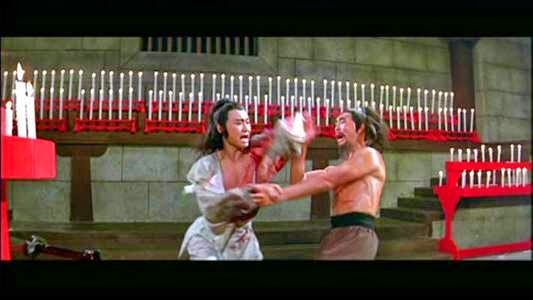 When Chang and Kao happen upon the beaten master, Chang vows to kill Pray and the two have a duel in which the latter is killed. As all this is going on, Chang has been developing a friendship with a man known simply as Green. The two met at the Red Chamber while spying on a prostitute playing the Guzheng (a scene very similar to Meng's Forest Villa encounter in Killer Clans). Green is a killer and a drunk, and the prostitute playing the Guzheng is in love with him (though his interest is mainly in wine). However it seems Green is noble, too noble for his profession, and that might be the cause of his drinking. 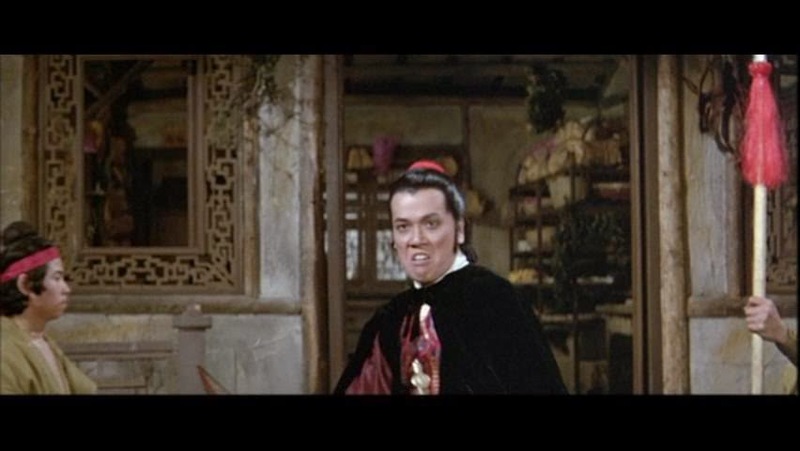 Over the course of the film, Green and Chang meet several times and fight together against foes. Later, and seemingly by chance, they attack a crooked gambling hall run by Pai (Kao's nemesis). After defeating Pray, Chang arrives at Kao's residence to find him in the act of hanging himself. This is all a front of course, but Kao convinces him that he wants to take his own life because he cannot avenge the death of his family and loss of his villa by Pai. Chang is moved and vows to kill Pai for his friend. It should be pointed out that, as the movie progresses, Kao transforms as a character. Initially he just seems a bit self centered and cowardly. Gradually he grows more scheming and cruel. This is accompanied by physical changes in the form of posture and dress, with each act of evil. 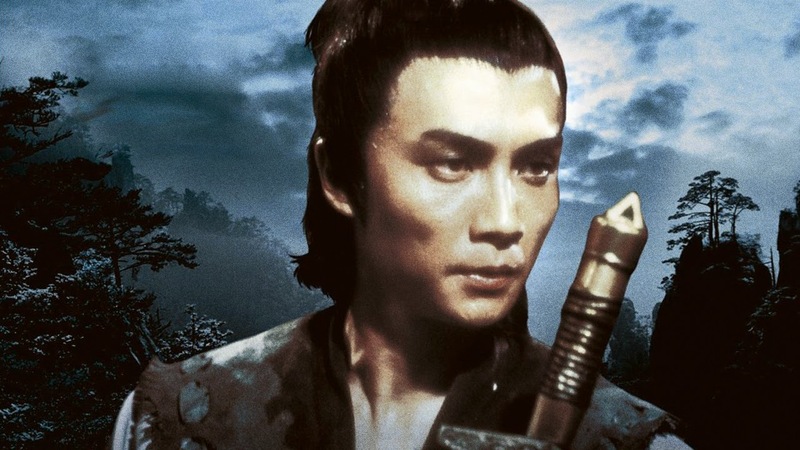 By the time Chang vows to kill Pai, Kao has already killed his own master and taken the Moonlight Sword, at which point he starts to resemble Dracula. Before attacking Pai's villa, Chang goes once more to the Red Chamber to hear the Guzheng, and there he meets Green again, who has heard of Chang's plans and intends to accompany him. After drinking and strategizing they make their move. The attack on Pai's villa is filled with action, with Chang and Green having to take on over 34 guards and several elite heroes such as Wolf, Lance and Sleeping Wizard, before they can encounter Pai. Sleeping Wizard is the most memorable, and played mostly for humor. He literally fights while he sleeps. His stealth is also uncanny, enabling him to literally sneak up on Chang and Green, using their backs to catch a few Zs. The two heroes face off against Pai in candled chamber where the villain uses a special solution to breath fire on his foes. The scene is quite long, and has some interesting choreography (will address the fight scenes of the film below). As they are killing Pai, Green reveals that he has been paid 500 taels to kill Chang and it is implied that he does so. After Chang's funeral, Green goes to collect his money from Kao, who is now rediculously evil and surrounded by newly hired henchmen. Kao attacks Green and the final fight of the film ensues. During the battle, Chang leaps in from the trees revealing his death was staged. He and Green give a speech about true friendship before resuming the battle. This is another long and bloody swordplay scene, with some interesting use of wires. Kao's demeanor and tactics appear very bat-like, with him flying up into the air and then attacking from the shadows. Green sacrifices himself to save Chang, and kills Kao in the process, for one of the most marvelous death shots witnessed on film (less artsy and expensive but more impressive than the final shot in 300 in my view). The fight choreography in this movie is a bit rigid, but that is by design. It is stylized and not in the smooth and elegant way of Come Drink with Me or House of Flying Daggers. This has more of a staccato beat and the actors sustain a pose after each strike. It is very much a late 70s martial arts movie in that respect. Personally this isn't my favorite style of choreography but in this case I think they do some great things with it. The movements are wide and exaggerated but they have an enchanting rhythm. Within the context of that style, the movie excels and there are some brilliant swordplay moments. The opening music is marvelous and sets the tone of the entire film. The melody is played again and again through the film (notably by the lady of the Red Chamber on the Guzheng). The song is called Hao Xia and by Lo Wen (according to Chang Yaoyuan). Apparently the name of the some is identical to the film, but the translation is a bit off. Either way, I think the song is important enough that I am linking it here. The feel of the song and the lyrics help hold the film together. The Last Hurrah for Chivalry ties in nicely with my last entry, Killer Clans. Both movies deal with the dark side of the martial world and both deal with the question of whether killers can have genuine relationships. Killer Clans answers this with a 'no'. In that movie it is clear that to kill means to be alone, and the hero finds love only by leaving Jianghu (the world of martial sects and heroes). But The Last Hurrah for Chivalry offers a more optimistic response, though it does demand blood. The Hero in this film finds true friendship at the cost of his friend's life. It goes without saying, I recommend this film to gamers (I am avoiding movies I wouldn't recommend in these reviews). This is also a John Woo film so I think folks who might not be into the genre may still want to check it out just to see his earlier work. When I first saw The Last Hurrah for Chivalry I wasn't as into it. It wasn't until the assault on Pai's villa that the movie really started to grab me. But it grew on me with each viewing and crept into my favorites category. I do think this is a film that improves the more you watch it. In my opinion this is the best movie in Wai Pak's filmography just based on what he did. His work with Sammo Hung and Jackie Chan is also good but as he is featured in this more I like this better.